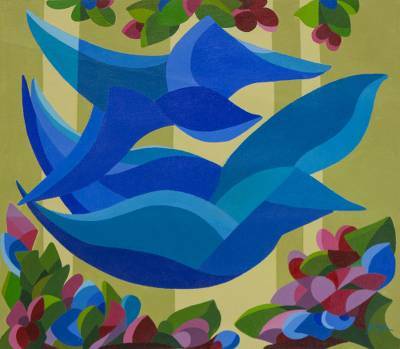 In an abstract style, two elegant blue birds flutter between colorful flowers. Brazilian artist Goga paints this lovely and awe-inspiring composition, championing a characteristic style that makes for an excellent conversation piece. Titled Pássaros entre flores in Portuguese. You can find 'birds Among Flowers' (2018) by Goga in paintings categories such as Animal Themed Paintings, Abstract Paintings, Abstract Paintings and Acrylic Paint Paintings. Enjoy exploring these sections for other Novica treasures.